For ither uises, see Tivoli, Lazio (disambiguation). 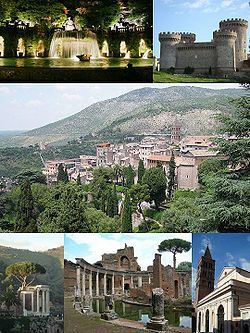 Tivoli (/ˈtɪvəli/; Italian: [ˈtiːvoli]), the clessical Tibur, is a auncient Italian toun in Lazio, aboot 30 kilometres (19 miles) east-north-east o Roum, at the faws o the Aniene river whaur it issues frae the Sabine hills. The ceety affers a wide view ower the Roman Campagna. Wikimedia Commons haes media relatit tae Tivoli.